Seth Godin, the philanthropic ideas merchant, has created this handy tool. It's all the Web 2.0 companies you could think of, and a few hundred more, with traffic ranks from Alexa. Who wouldn't want one of these? 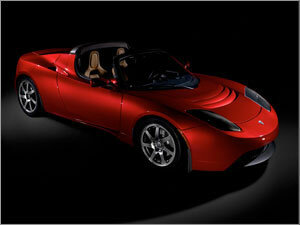 The Tesla Roadster, the world's first electric sports car. Glide from zero to 60 in six seconds with just the sound of a 'blender' and the wind. The perfect way to marry green goodness with boy-racing speed. The first 100 sold out immediately. I wonder if we'll see a "green" Ferrari anytime soon? Click the image to watch the movie. Alongside the beautiful hot summer we're having in the UK, one of the globe's largest ice masses is, unsuprisingly, melting faster and faster. Of all the environmental effects happening it's the ice caps melting that most shocks me into action - maybe it's the purity of these areas and their stunning landscapes. 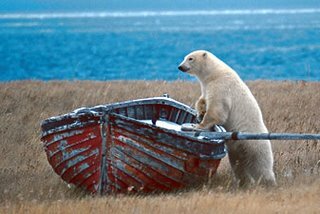 If Greenland melts it will add 21 feet to our sea levels. That's London gone, oh and Sydney, Shanghai, Saigon, California (no wonder Arnie is on the case) and every current beach resort in the world. The film Terminator 3 was called; The Rise of Machines. Welcome to The Rise of the Tides. Despite the rhetoric this task is too big for governments alone. That's why big business, communities, schools, entreprenuers and individuals have all got to do their bit. Read "Greenland melt 'speeding up'" report the BBC today. The BBC reports on a study "Britain's digital tribes revealed" which I think points to the future of digital marketing and content serving. We're such a detail industry, looking at accountability and measurement as our competitive advantage, yet we lack some of the precision of the Direct Marketing business and audience research of other media. Rupert Murdoch talked of new breads of digital natives in his keynote address to his editor's last year. This research might give us industry bods some of the tools to better know our users and give them the right content and advertising for their level of online knowledge. I'd like to see this plugged into Double Click's ad serving tools or into Content Management systems via an open API. I'm a Type H22, which is E-committed. Committed in the sense of determined, I hope, rather than slightly crazy.